Posted on Saturday, November 19th, 2011, by Brenda Pottinger under Misc.. It is always so exciting to get to work with a new location that is so inspiring! Laurel Court is an amazing hidden Cincinnati gem that I have been so excited to photograph for a long time. When Wesley and I started working on this concept shoot we knew we wanted it to look amazing. There are so many talented wedding vendors right here in Cincinnati that we couldn’t wait to give them an idea and let them create something special. Putting together such a detailed shoot takes a lot of planning and it is much like pulling together a party or an event. Wesley made her storyboard come to life! A special thanks goes out to all of our super talented vendors! 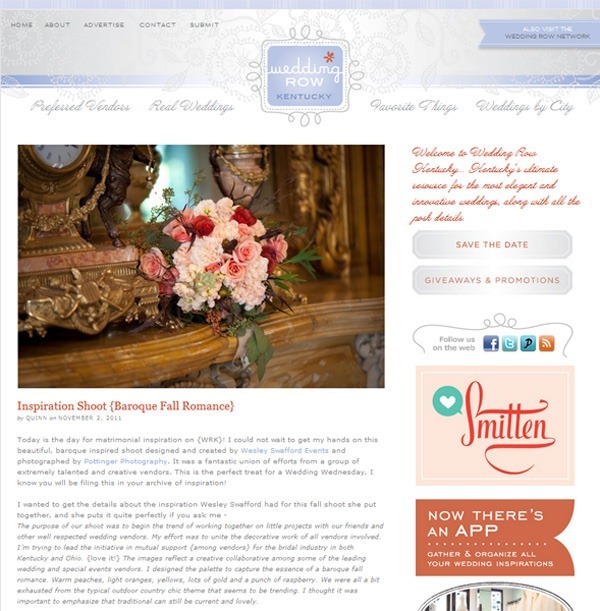 Thank you to Wedding Row Kentucky for featuring us! We hope that these photos will inspire you – enjoy!